The first successful container ship, the Ideal X, sailed on 26 March 1956 from Port Newark to Houston. The vessel, previously a World War II oil tanker, had been acquired by an ingenious entrepreneur called Malcom McLean. On that day the containerization revolution began. Until the first half of 20th century, sea freight involved many disadvantages: a large number of workers were required to load and unload the ship and the cargo could be easily damaged due to accidents or theft. Single items had to be manhandled and the whole process was time consuming. Break-bulk shipping became less and less sustainable with the expansion of international trade and railroads, and new viable ways to transport goods were explored. After McLean, many other entrepreneurs decided to use containers for sea freight. Shipbuilding companies started producing vessels specifically designed to transport containers. In 1960, Grace Lines became the first firm to operate a fully containerized ship for foreign trade. This rapid development in sea freight pushed the International Standardization Organization (ISO) to set standard sizes for the containers. In 1961 the Twenty Foot Equivalent Unit (TEU) was established. Use of containers boomed in the late 60s. Ships were built whose capacity exceeded 2000 TEU, thus allowing to transport more and more efficiently. In that period, containers became the backbone of the American line of supply during the Vietnam War. Ports began to develop and adapt to the new technology available. Ad hoc cranes contributed to form the skyline of modern harbors. In the next two decades the industry grew further interconnecting very distant countries. Between 70s and 80s, the number of TEUs carried by containership operators grew by more than 300%. Containerization has brought many advantages to international freight. The loading and unloading process of ships is now largely automatized, thus reducing the risk of damaging the cargo. In addition, it now takes a shorter amount of time from the item’s production moment to its delivery and sale to the costumer. 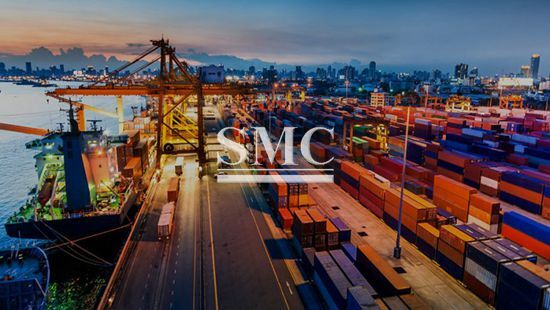 Intermodal containers have also made possible important changes in the manufacturing process, which has become more flexible and adaptable to the costumer’s preferences. Here at Shanghai Metal Corporation we produce more than fifteen different types of containers. They are available in different dimensions and for different functions. For instance, we offer the 20 or 40 ft standard container as well as cement bulk containers and offshore containers. For more information and inquiry, or if you want a full list of products, please click here.